A Land Beyond the Stars is a new website created by the Geography and Map Division of the Library of Congress and the Galileo Museum in Florence. As well as the interactive version of Waldseemüller's 1507 map the site includes a wealth of information and videos explaining 16th century understanding of cartography & astronomy. The interactive map itself contains a number of options to learn more about the Universalis Cosmographia map. These options include detailed explanations of the map's main five sections, translations of the Latin text and explanations of some of the map illustrations. Note : Martin Waldseemüller's 1507 map 'Universalis Cosmographia' has the 'America' place-name on what is now called South America. The name was used by Waldseemüller in honor of the Italian explorer Amerigo Vespucci. THERE’S A PLACE where the internet, Wi-Fi, and GPS do not exist. Communication is haphazard: Sometimes messages arrive different times at the same place, the same time at different places, or not at all. It’s not North Korea, or a time portal to the 1980s. It’s anywhere, today, under the ocean. For scientists talking to submarines, robots, and other instruments, data travels at dial-up speeds of single bytes per minute—far slower than the megabits per second we use in the office or at home. Oceanographic researchers have gotten around the problem by connecting devices to tethers of fiber optic cable or copper wires, which provide enough bandwidth to stream images of the Titanic or weird creatures that live around underwater volcanic hot springs. But the heavy cables can also get tangled, dragging down the vehicles they connect. But a group of scientists from Europe and the United States are trying to cut the cable on underwater data. They foresee a wireless communications network that would allow sleek, torpedo-shaped autonomous underwater vehicles to scout the murky depths, collect information, talk to each other, and then return to a central point to dump their data at regular internet speeds. In the past two years, their collaborative project—called Sunrise—has drawn upon the skills of more than 40 marine researchers and computer scientists from eight European nations. They have explored Roman marble columns laying on the seafloor off Sicily, looked for lost shipping containers in a Portuguese harbor, and mapped a portion of the seafloor with the Portuguese Navy—all using networks of underwater modems. 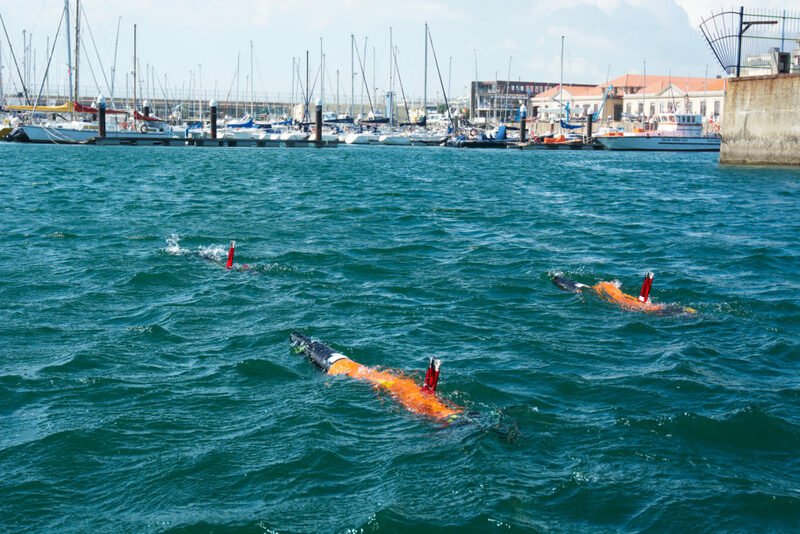 Underwater robots can explore seas and rivers, gathering in groups to solve problems together, if they learn to cooperate. A group of robots - each carrying a particular set of sensors - will scour the seabed looking for a lost object or a chemical leak. By working together, they can collect a lot of information in a short space of time. 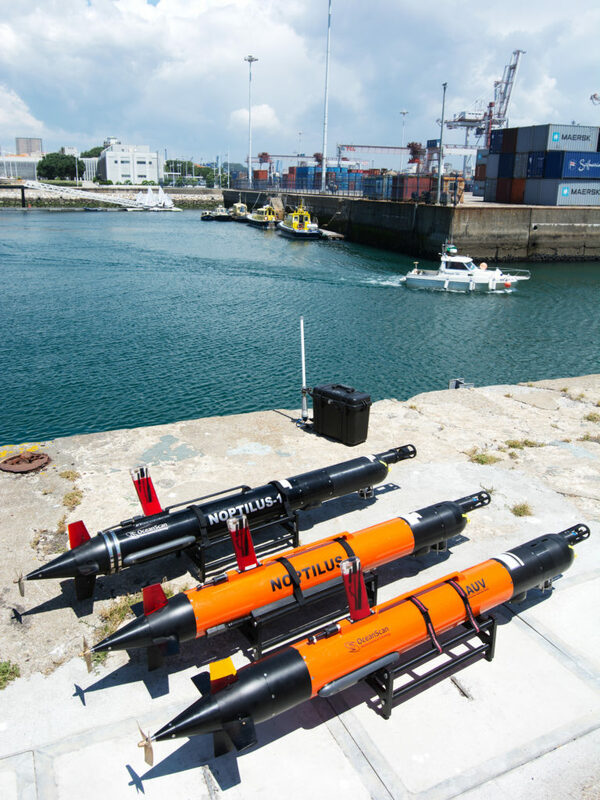 Later this month, another field test will use three autonomous underwater vehicles to run surveillance on aquaculture pens off Calabria in southern Italy. They’ll later dock to a small wireless modem, and upload data to researchers back in Rome. “We call it the internet of underwater things,” says Chiara Petrioli, professor of computer science at University of Rome La Sapienza and the Sunrise project coordinator. The first way to make that happen is to boost both the bandwidth and speed of existing underwater acoustic modems, which wirelessly transmit information through water with sound waves. The second is to use so-called optical modems that transmit information through visible or infrared light beams. They have a lot of bandwidth, but only work for short distances. At Northeastern University in Boston, electrical engineer Stefano Basigni is trying to pack more data into acoustic wavelengths. “The ways to achieve higher speed have to do with the design of the actual transducers, and the way you perform channel modulation,” said Basigni, who is part of the Sunrise group. To test that technology, Basigni and his colleagues have set up a demonstration project in Nahant, a small fishing community on the northern edge of Boston Harbor. 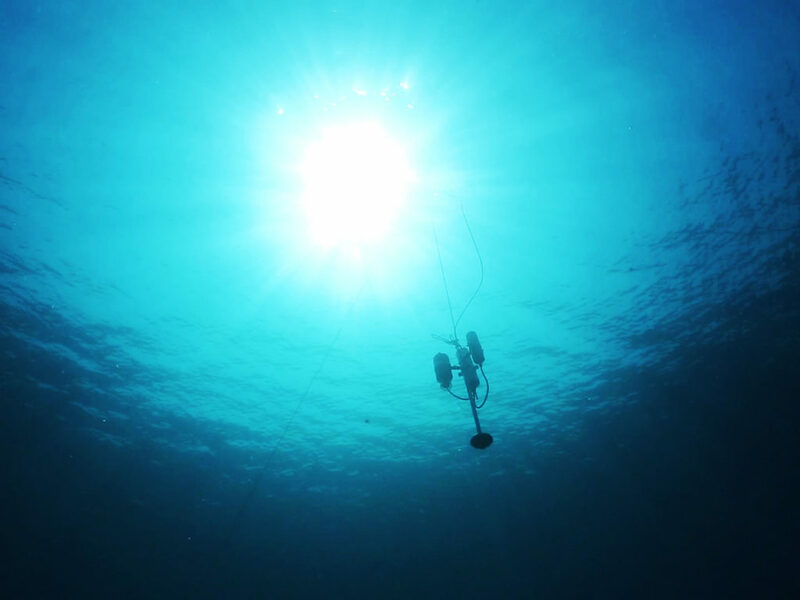 Normally, ocean scientists would lay cables out to a monitoring station that collects and records data on marine life, pollution, and water quality. “We deploy our instruments today, and then in a week, if the lobster fishermen haven’t destroyed their equipment, we would go back and retrieve the equipment,” says Basigni. 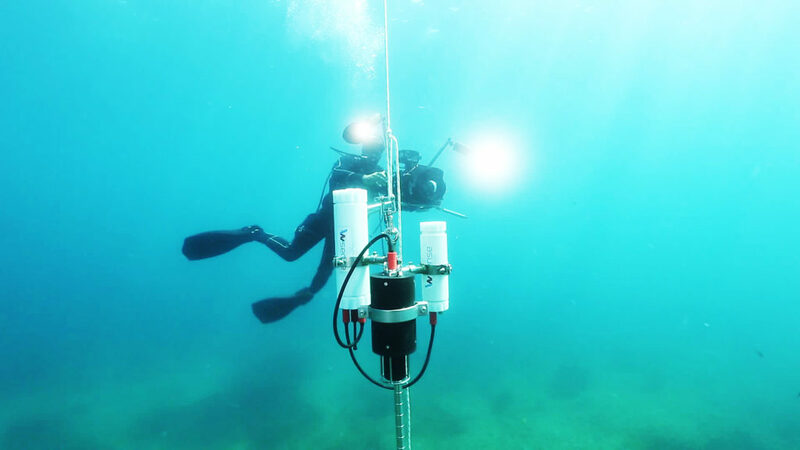 Once Basigni and others figure out how to better connect underwater instruments through a wireless network, they see applications beyond collecting scientific data. Say, opening underwater gates at the harbor mouth and guiding ships to their dock, livestreaming a tropical reef exploration, or following a pod of migrating whales in real-time. The researchers are experimenting with a mix of slower, but longer-range acoustic modems and the short-range high-bandwidth optical modems. “Once the networking has been perfected—and it will be—it is a matter of imagination,” says Basigni. But boosting data capacity and speed isn’t enough. They also have to get the devices to talk to each other. The Sunrise team in Italy is using an Esperanto-like language called Janus with their underwater drones. 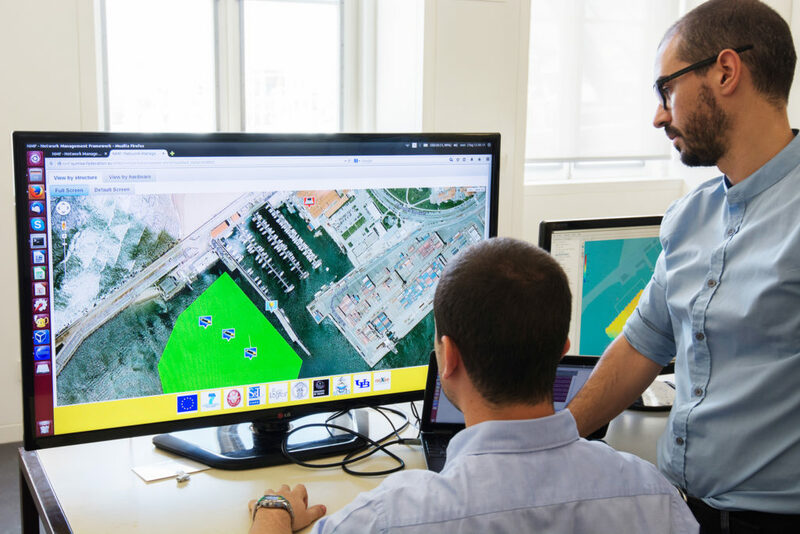 They are planning a real-world test in several months off the coast of the Italian port of La Spezia to perfect the protocols, and to use a new method of recharging the batteries of autonomous underwater vehicles in floating docking stations. These real-world experiments are difficult to pull off. The underwater world is rough on electronics, salinity and temperature differences make communications unreliable, and foul weather can send seasick oceanographers back to their cabins. Still, these systems are getting better, according to Louis Whitcomb, professor of mechanical engineering at Johns Hopkins University and an expert in underwater acoustic communications. Whitcomb just returned to Baltimore from a 45-day oceanographic expedition north of the Arctic Circle to explore an underwater mountain and its sea life. The underwater drones he was using had to surface every few minutes and send back their location in 64-byte data packets once per minute—with each package taking six seconds to transmit. In plain English: It was super-slow. “We’re not going to be able to push HD TV over an acoustic modem anytime soon,” says Whitcomb. 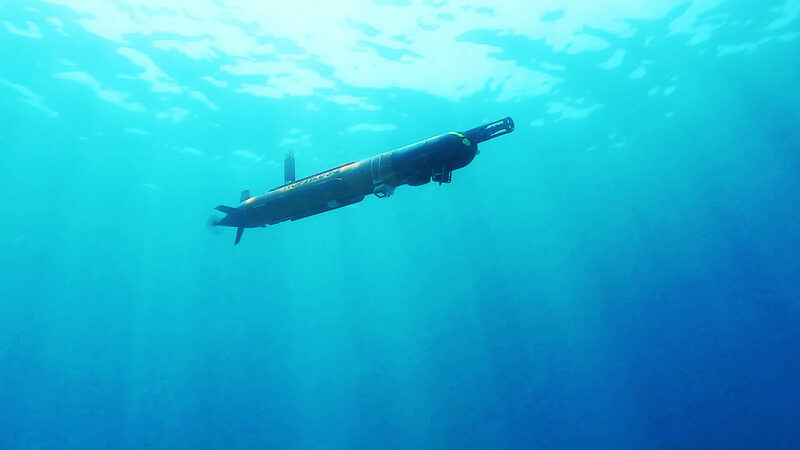 “But we have a range of technologies and we will see the development of vehicles that will bridge these communications regimes.” Whitcomb sees a day when fleets of underwater drones can scan distant waters, return and dump their data into high-speed modems. That makes exploring Mars look relatively easy. EU : Connecting the oceans: Sounds good! Somali Piracy: Resetting the Stage? A series of attacks in 2015 may serve as an indication that the stage is being set for piracy’s return off the coast of Somalia. At least 9 merchant vessels, five dhows, and one fishing vessel reported being approached or attacked by Somali pirates. The five dhows were all successfully hijacked by pirates. While these incidents may serve as an indication that Somali pirates retain the capability and intent to return to piracy, it is not clear what that might look like. Though it is unknown if a return of Somali piracy would resemble the same pattern as in years past, Somali pirates remain a serious threat to the well-being of seafarers. Even with maritime piracy at a 21-year low, experts are warning of a potential resurgence in East Africa among other risks. "Suddenly, the opportunity is improving," anti-piracy expert John Steed said about Somali piracy. "No one has tried it yet, but the potential is there for it to come back." The last wave of Somalia piracy peaked in 2011 with 176 attacks. during the piracy crisis but have returned. It declined to almost nothing by 2015, thanks to an increased foreign naval presence and industry precautions like posting armed guards, moving faster, and following certain routes when passing through the area. At the end of last year, the industry issued new recommendations that reduced the size of the danger zone. All piracy attacks in 2015 - grey dots represent regional vessels. Heading into 2016, however, IHS Inc. said Somali piracy was a major risk thanks to instability and unrest in the region. "The two conditions that led regional politicians to [support pirates], namely a lack of alternative economic opportunities and a threat to their control of their territory, are currently being recreated in the Galmudug region of central Somalia," the risk consultancy warned. A photo taken on January 4, 2010 shows an armed Somali pirate keeping vigil on the coastline near Hobyo, northeastern Somalia. Oceans Beyond Piracy (OBP) also warned of a piracy "reset" in its mid-year report. Steed, the non-profit's regional manager for the Horn of Africa, walked us through some risk factors. —"Naval forces are getting [drawn away]. There’s a great deal of work for them to do, particularly with the migration problems and the issues higher up the Horn [of Africa] …. The days of the European naval force may be coming to an end." —"Ships' captains are under pressure from the companies to go slower and in some cases closer to the coast." —"No one has helped build the Somalis a decent coast guard or maritime police …. In the main part of Somalia and all down the east coast, there is no real Somali seagoing capability." —"[Somalis] see these big international trawlers, as they see it, stealing their fish, and that breeds animosity amongst and support for the pirates who go out and sometimes capture fishing boats." —As 2015 progressed, private security teams were used less and less frequently by ships in the area, and when they were used, shipping companies increasingly opted for smaller and cheaper teams. Although the European Union recorded no Somali pirate attacks in 2015, OBP says it has confirmed 5 small hijackings and other pirate-related incidents. The Siraj and Jaber dhows were hijacked close to the Somali shore in 2015. Globally, another reason to worry about piracy is the increasing use of kidnapping. Southeast Asian pirates "have altered their tactics to take advantage of the high ransoms that they can receive from kidnapping crew," risk consultancy GardaWorld wrote in a recent report. That region has seen 12 maritime kidnap incidents in 2016 compared to zero in 2015. West Africa has seen a similar trend. "Kidnap for ransom has increased significantly in the waters off Nigeria, with hijacks for product theft now comparatively rare," GardaWorld wrote. Pottengal Mukundan, director of the International Maritime Bureau, called this a "disturbing" shift. East Africa, too, is seeing the same trend. The number of seafarers taken hostage in the area climbed from 17 in 2014 to 108 in 2015, according to OBP. Currently, there are at least 36 seafarers being held hostage in Somalia. Twenty-six of them, the crew of NAHAM 3, have been held there for nearly five years. (a parametric latitude which gives a sphere equal surface area relative to an ellipsoid) and graph. The way we see the world needs an update. At least that's the thinking behind the AuthaGraph World Map, this year's grand prize winner of Japan's prestigious Good Design award, an annual competition hosted by the Japan Institute for Design Promotion that highlights innovations in a variety of sectors, including home appliances, cars, industrial goods, and architecture. It shows there are no "four corners of the earth" by arranging several world maps without visible seams around a world map with color. You can see Antarctica at the right bottom is close to not only South America but also Africa and Australia. It introduces as well how the map is made. Tokyo-based architect and artist Hajime Narukawa developed the map to be an accurate representation of our spherical planet—no easy feat, it turns out. You mean the one we have up on our wall, filled with pins to mark our travels, isn't good enough? An original method for maintaining areas proportions is called "iso-area-mapping." And an original mapping process by combining different projection methods via intermediate objects is called "multilayer-mapping." The 16th century gave us many innovations and discoveries that we still happily use today: the graphite pencil, bottled beer, the Copernican model of astronomy. And then there's the Mercator projection, the map drawn by a Flemish cartographer back in 1569 that remains the go-to textbook illustration of our world despite not being very accurate. Because of how a map transfers a spherical shape onto a two-dimensional plane, the Mercator projection actually distorts the size of entire continents: Greenland is depicted as about the same size as Africa, when in reality it's about as big as Algeria, and Antarctica is seen as a giant globe-spanning mass lurking across the bottom of our world, when really it's as long across as the continental United States. 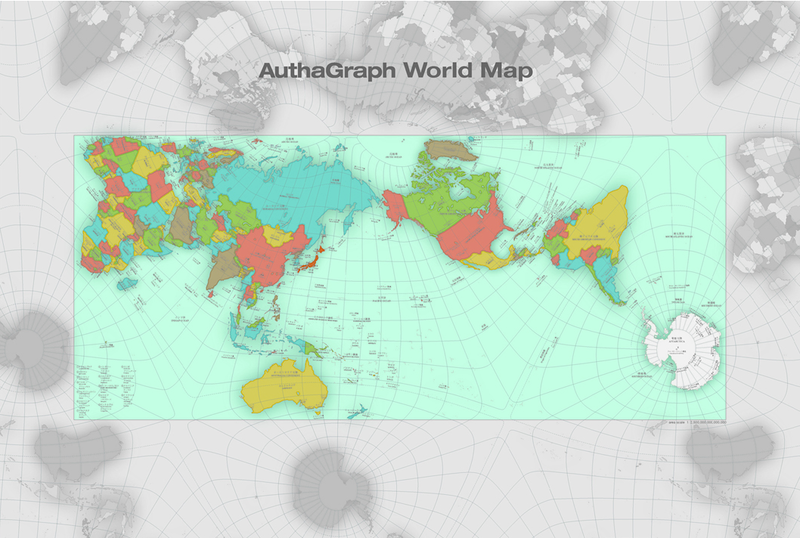 AuthaGraph map is able to transform an entire sphere to a rectangle as Mercator projection does while it substantially keeps sizes and shapes of continents as Dymaxion map does. 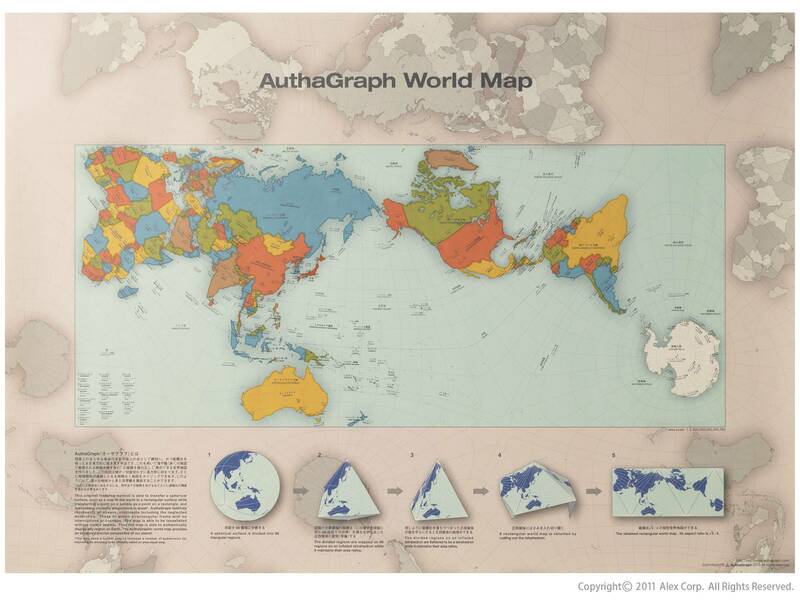 On the AuthaGraph map, continents are drawn on angles, rather than the straight-across model of Mercator. So not only does it more accurately represent the size of continents and oceans, but also the distances between them. But its real innovation is in how the map can be transformed onto a three-dimensional globe without losing that accuracy. 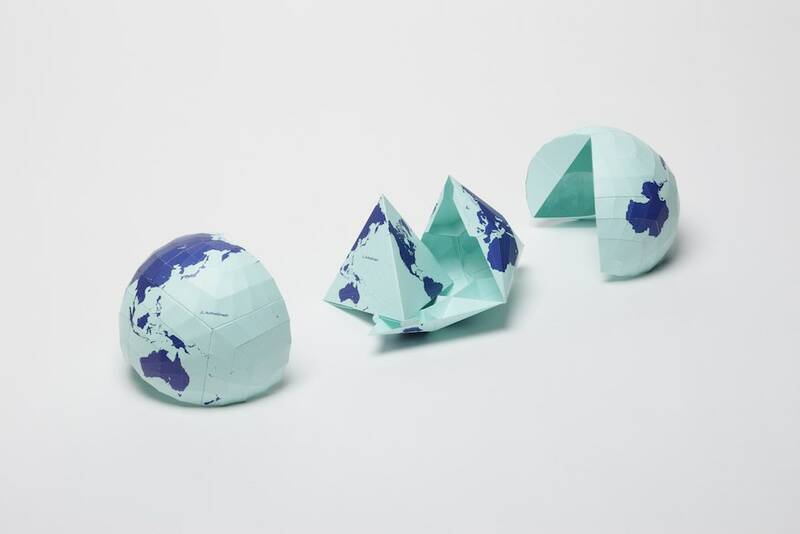 Using an assembly kit, users can follow five steps to fold the map from its two-dimensional rendering into various shapes before landing on the sphere, mirroring the process Narukawa and team went through to arrive at the model, and looking at our world in new ways and with different regions at its center. It is able to tile the AuthaGraphic world map without gaps and overlaps. The way of tessellation has seamless connections between maps as if it is an Escher’s tiling. Same as fishes and birds in his painting, six continents are never fragmented and seven oceans keep their continuous networks. It had been thought the world is on an infinite plane since geometries of a sphere and of an infinite plane are similar. Walking on both surfaces, we do not meet an end. A geographical network in the map is able to expand to any directions on the tessellated maps. Thus the world map reproduces the spherical world without dead end on a plane. The map is available for purchase in various forms, including a wall map, a composite poster of 40 maps that are continuous in multiple directions and the aforementioned foldable globe. On the tessellated maps it is able to frame a view field covering a full set of a world. The frame functions as a viewer which enables user to slide and rotate and then to frame a new world map with a preferable region at its center. They provide a new angle of perspective to equally view the world so as to be free from existing perceptions defined by usual phrases such as “far east”, “go up north”, “Western”. There's still work to be done, however, before we can call the AuthaGraph truly accurate: A small footnote on the Good Design website notes that the model needs to increase the number of subdivisions used in mapping areas and distances—that is, breaking it into smaller and smaller sections—for it "to be officially called an area-equal map." An orange line on tessellation-world composed by 49 maps tracks a journey of International Space Station (ISS) for eight hours. Its coordinates are provided by ‘Cerestrak’, a website distributing ISS’s orbital data. NASA and the US department of defense issue the original data. The coordinates are defined by calculating the data to reflect corrections of the orbit. It has past 140 years since ‘Around the World in Eighty Days’ (Verne) was published. Satellites fly across the world in hours while they play leading roles of telecommunication and remote sensing such as observing weather, environmental pollutions and natural resources. The tessellationworld map shows such rapid movement of a satellite in one line. Still, it's close enough that back in 2015, Japan adopted the map for use in their textbooks. Find out everything you wanted to know but never dared ask about foils, with this 3D presentation. 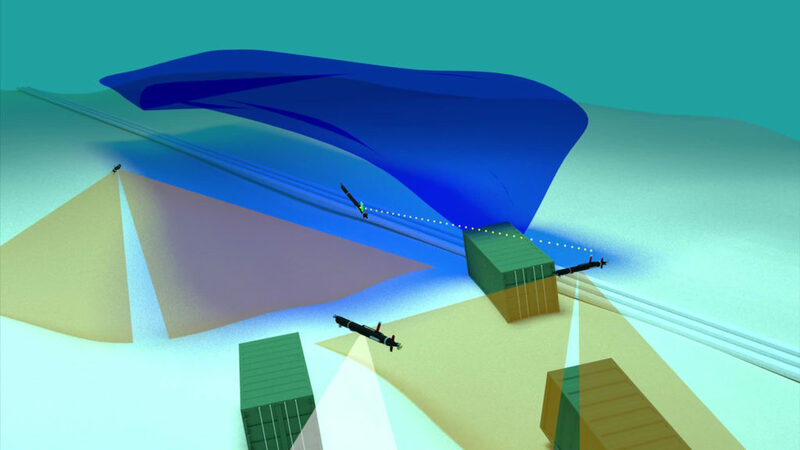 With a montage of real images of the boat sailing, and 3D computer modelling, it illustrates very clearly how they are operated and function on an IMOCA 60 like Safran. These funny foils, shaped like Salvador Dali’s moustache, will no longer hold any secrets from you. This is one of the major new features of this 5th generation Imoca monohull. Since their arrival on the scene the foils have caused a lot of ink to flow and unleashed great passion. Indeed, there are both supporters and opponents of these new appendages, whose very shape is reminiscent of the moustaches of a famous Spanish painter. An unquestionable architectural development, foils are nonetheless a daring challenge for those who have opted to equiptheir steed with such a device. The Commission for the Conservation of Antarctic Marine Living Resources (CCAMLR) was established by international convention in 1982 with the objective of conserving Antarctic marine life. This was in response to increasing commercial interest in Antarctic krill resources, a keystone component of the Antarctic ecosystem. Being responsible for the conservation of Antarctic marine ecosystems, CCAMLR practises an ecosystem-based management approach. This does not exclude harvesting as long as such harvesting is carried out in a sustainable manner and takes account of the effects of fishing on other components of the ecosystem. CCAMLR's contribution to global food security is through its programs of research, monitoring and introduction of conservation measures. CCAMLR is an international commission with 25 Members, and a further 11 countries have acceded to the Convention. Based on the best available scientific information, the Commission agrees a set of conservation measures that determine the use of marine living resources in the Antarctic. “I think it’s a really significant moment,” he said. “We’ve been working towards this for many years. The Antarctic protections had been urgently sought because of the importance of the Southern Ocean to the world’s natural resources. For example, scientists have estimated that the Southern Ocean produces about three-quarters of the nutrients that sustain life in the rest of the world’s oceans. The region is also home to most of the world’s penguins and whales. The Weddell Sea is one of the last pristine areas in the Antarctic, not least because the international fishing fleet has spared this region so far. The European Union submitted a proposal to the Commission for the Conservation of Antarctic Marine Living Resources (CCAMLR) for a marine protected area (MPA) in the Weddell Sea. The scientific background was compiled by experts of the Alfred Wegener Institute, on behalf of the German Federal Ministry of Food and Agriculture. This video shows why it is worthwhile to protect this unique marine region. The agreement also establishes a large 322,000 sq km “krill research zone” that will allow for reseach catching of krill, but prohibit toothfish catching. “Today’s agreement is a turning point for the protection of Antarctica and the Southern Ocean,” said Chris Johnson, WWF-Australia’s ocean science manager. But the expiry of the protections in 35 years was a significant compromise. It came after five years of failed negotiations, with opposition from China and Russia which have fishing industries in the region. The World Conservation Union definition of a marine protected area requires it to be permanent. “WWF has concerns that the Ross Sea agreement does not meet this standard,” Johnson said. See penguins, seals, whales, and more unique animals in this series of photos by Pew marine fellow and acclaimed photographer John B. Weller. These stunning scenes of life in Antarctica underscore what’s at stake if the world doesn’t act now to protect the Ross Sea, Weddell Sea, and East Antarctic waters. “It took five years of talking about this one proposal exclusively to get it across the table. And if you look at other marine reserves that are permanent, they’re in one exclusive economic zone – it’s only one country that has to make the decision. “And I’m positive that in 35 years, the conservation values that come out of the Ross Sea, the protections will be renewed. The campaign group Avaaz had, with Leonardo DiCaprio, launched a petition calling for CCAMLR to establish “the world’s largest network of marine protected areas in the Southern Ocean, starting with the Ross Sea and East Antarctica”. It received more than 2m signatures, Avaaz said. “There’s massive momentum in the world right now to protect our oceans,” said Luis Morago, campaign director at Avaaz. “Governments have just set the landmark target of protecting 30% of our oceans, and millions of people all over the world are pushing for more protected areas to achieve that goal.